Olympus Mons, the largest volcano in the Solar System is a shield volcano built up by lava flow after lava flow. Like the larger shield volcanoes Mauna Loa and Etna on Earth, many of these lava flows carried the liquid lava in open channels. 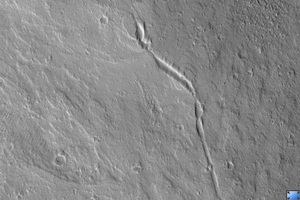 In some places these channels break down and the lava spills out, forming a broad fan. In the center of this HiRISE image ( PSP_003331_2005 ), you can see a lava channel that has fed many overflows to both sides. The lava was traveling from the southeast toward the north and northwest. When viewed at full-resolution, the HiRISE image shows a very irregular surface. This is caused by a thick layer of very small particles that are being moved around by the wind. 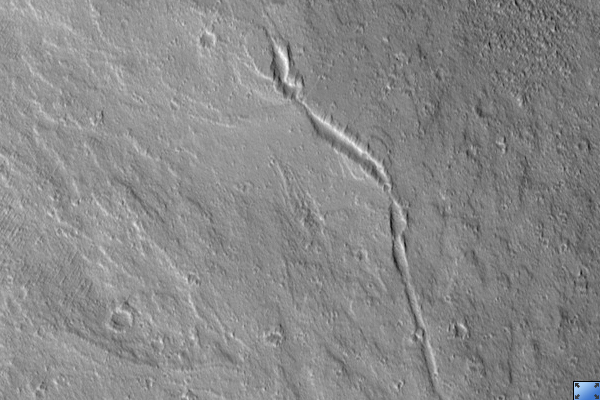 The linear features that could be mistaken for dunes in lower resolution images turn out to look more like wind-eroded ridges, called "yardangs" by geologists.